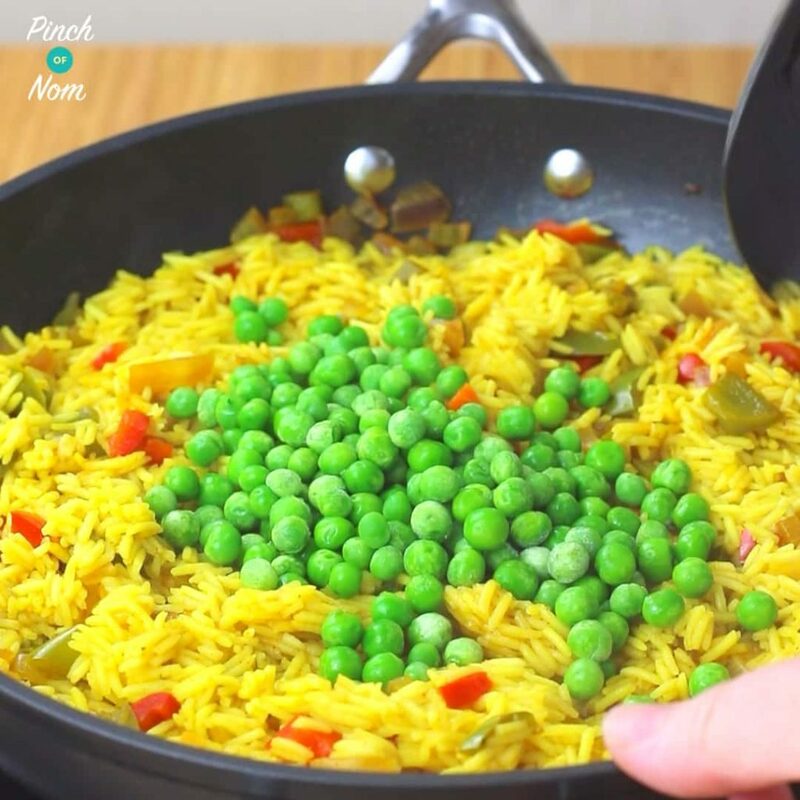 My favourite rice has to be Nando’s Spicy rice, so we decided to come up with a Slimming World Syn Free Nando’s Spicy Rice recipe! It’s the perfect Slimming World BBQ side dish. A few of our friends are Nando’s obsessed, and they seriously adore this Slimming World Syn Free Nando’s Spicy Rice. It tastes just like the rice you get from Nando’s, so much so, it’s uncanny! With the weather improving so much, it means just one thing. BBQ! We throw epic BBQ’s, and are always on the look out for new side dishes. 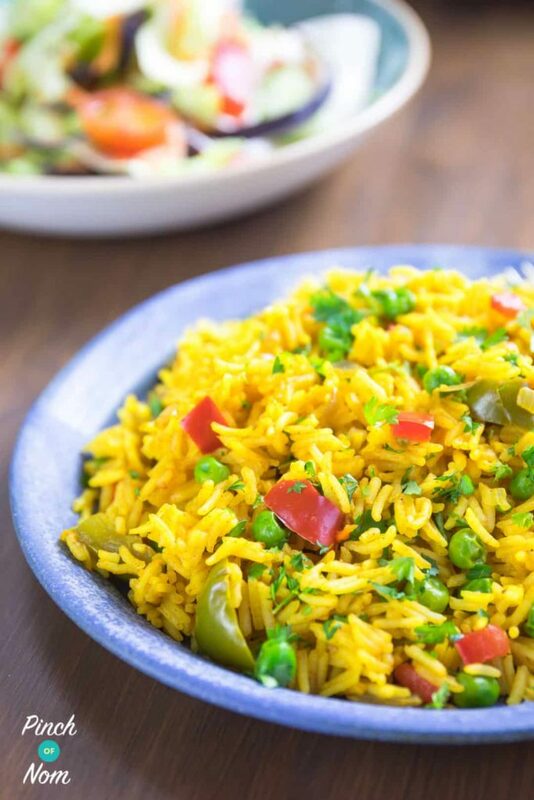 Everyone likes an easy to eat rice dish, and this Slimming World Syn Free Nando’s Spicy Rice is both easy, and tasty. This Slimming World Syn Free Nando’s Spicy Rice is also really, really colourful. They say you eat with your eyes, and this is most pleasing. If you wish you can add even more peppers, or any speed vegetables that you like. 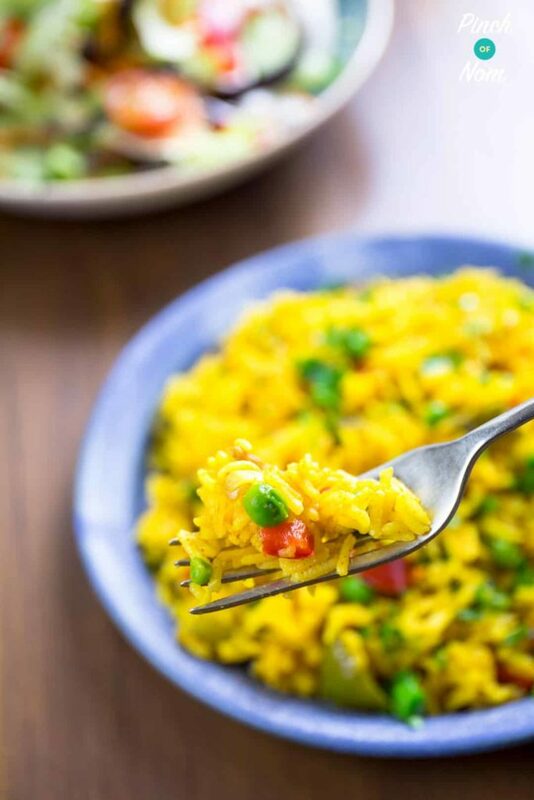 If you’re not keen on the chilli powder in this Syn Free Nando’s Spicy Rice, why not try our Syn Free Savoury Rice. 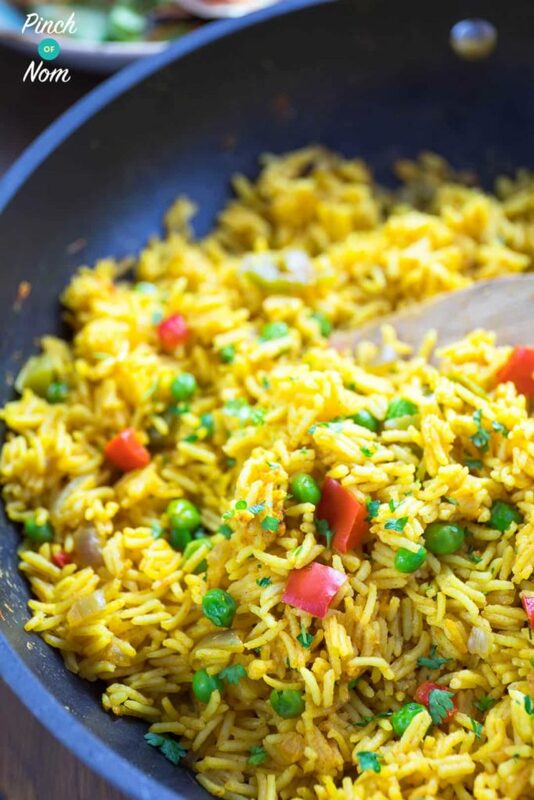 Some of you love this Syn Free Nando’s Spicy Rice recipe! 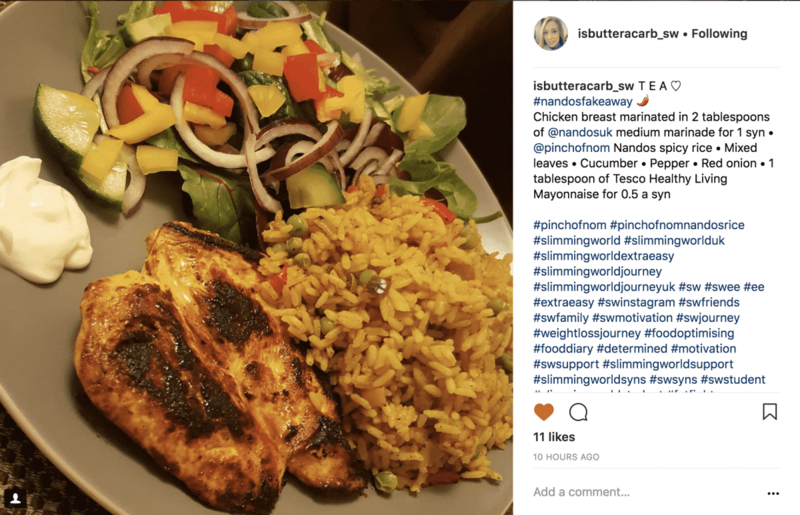 One of our Instagram followers @isbutteracarb_sw made this dish and loved it! 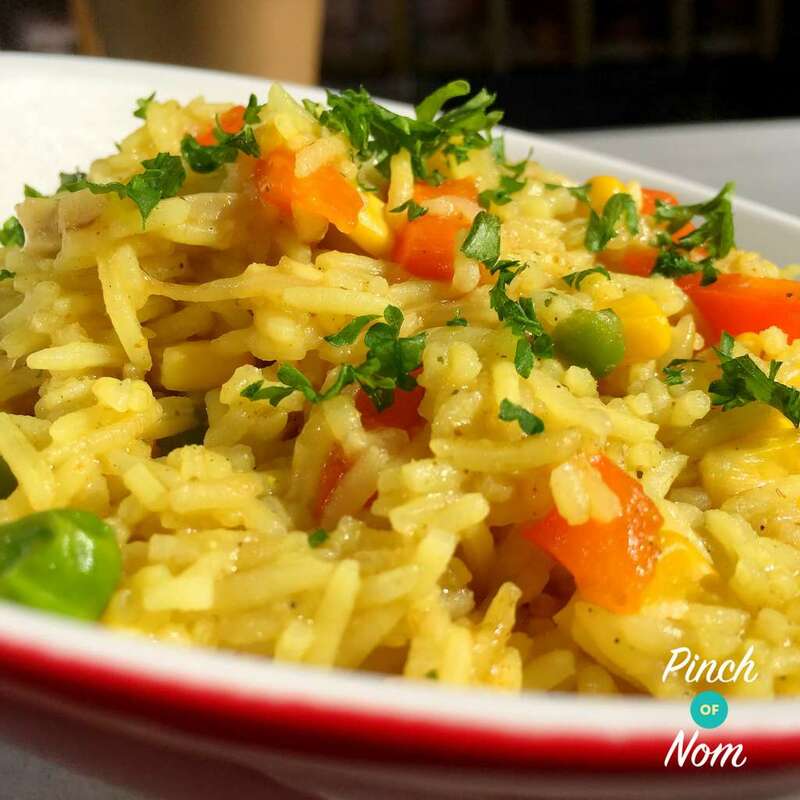 What do I need to make this Syn Free Nando’s Spicy Rice? Not much really! But you will need a few spices. 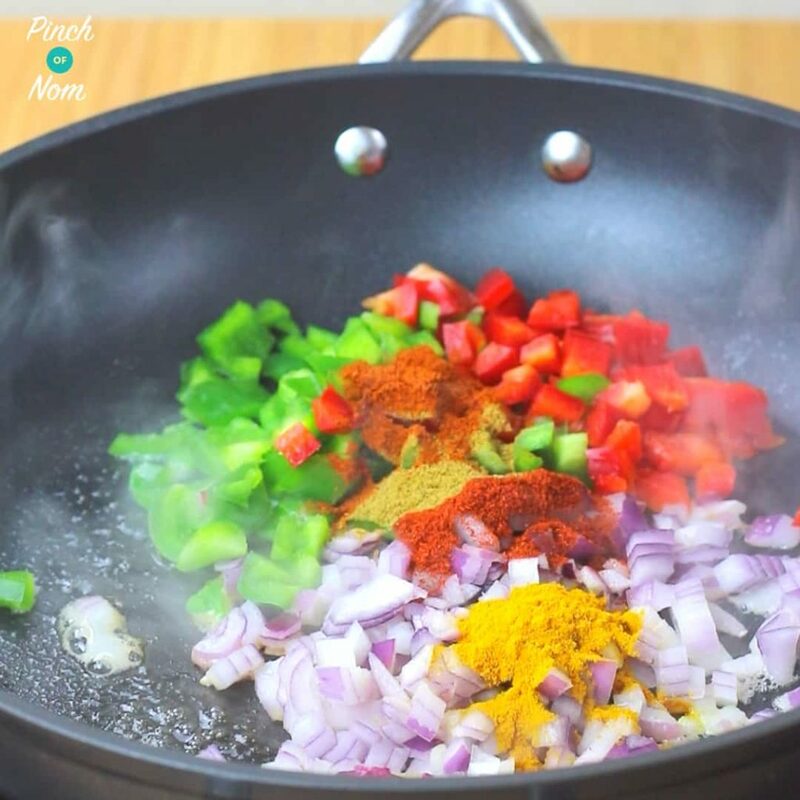 If you’re a seasoned Slimming World-er you will probably have a cupboard full of herbs and spices. However, if you’re a relative newcomer to the Slimming World journey then you may not. 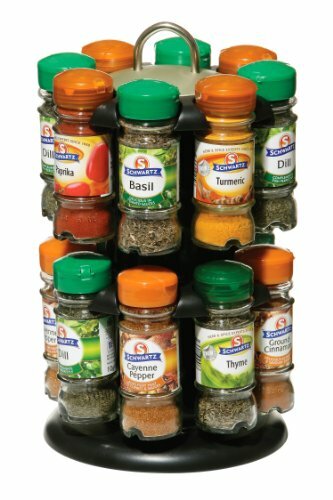 Don’t worry, you can pick up a spice rack from Amazon complete with 16 different herbs and spices. Pretty much every herb or spice you’ll need to get started! How do I make this Syn Free Nando’s Spicy Rice? Just follow the steps below. For the FULL recipe, including quantities please scroll to the bottom of the page. 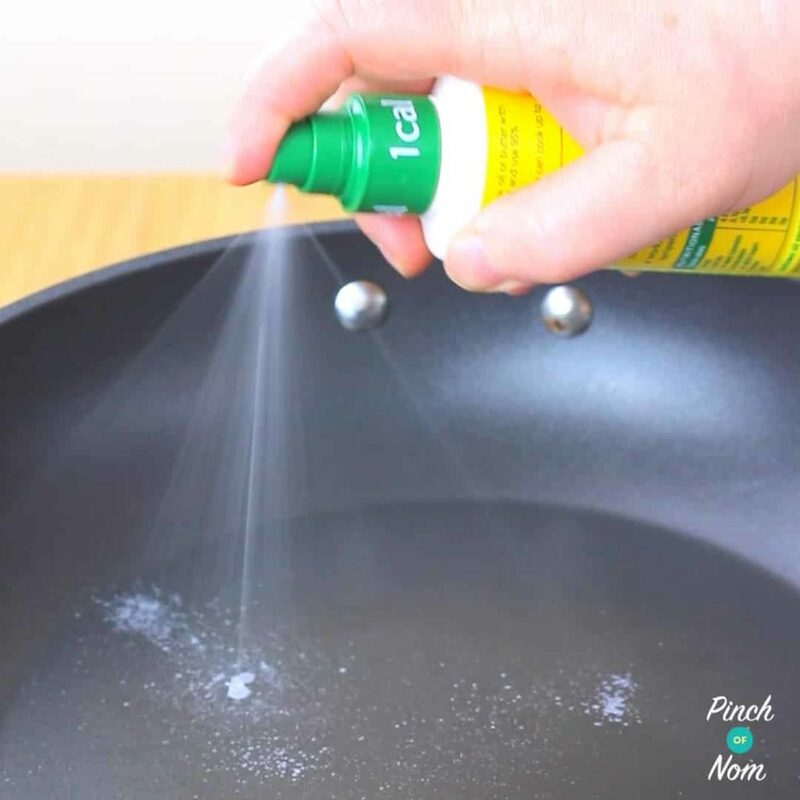 Spray a large frying pan with Frylight. It needs to be big enough to hold 6 cups of water. Add the chopped onion, peppers, cumin, chilli powder, turmeric and paprika. Cook until they start to brown slightly. While your waiting for them to brown dissolve the Chicken Stock Cube in the boiling water. Add the dry rice to the onions, peppers & spices. Stir to mix well and slick the rice. You can spray some more frylight if you wish. Pour in the hot stock, then add the Chicken Stock Pot and stir. Bring to the boil then cover with a lid and cook according to the packet instructions (usually 10 – 12 minutes). Stir during cooking to stop it sticking to the pan. 4 or 5 minutes before the end of cooking stir in the peas and replace the lid. 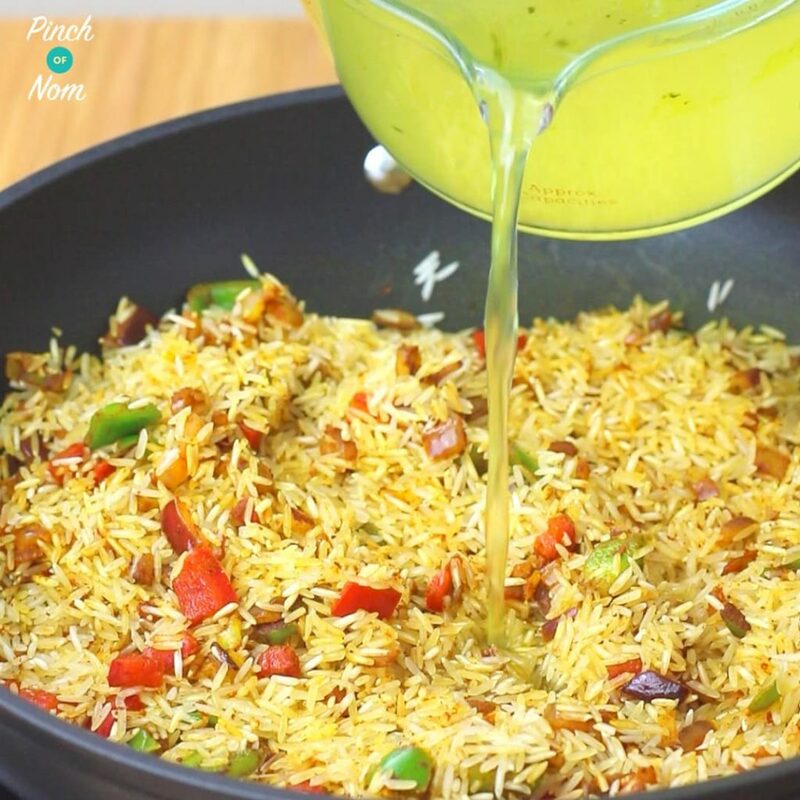 When all the water has been absorbed and the rice is cooked stir and serve! 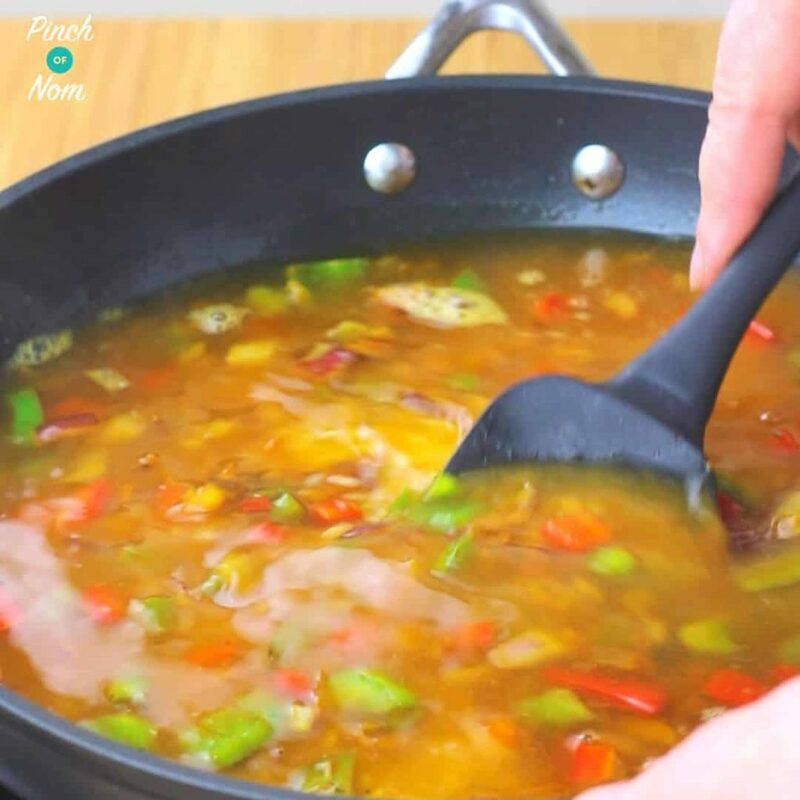 Want to see how easy this Syn Free Nando’s Spicy Rice is to make? Watch the video! Like this Syn Free Nando’s Spicy Rice? Why not try some other Summer dishes? Whenever we need to replace oil in cooking we use Frylight. Perfect for everyday frying and cooking, it delivers exactly one calorie per spray, which makes it Syn free! 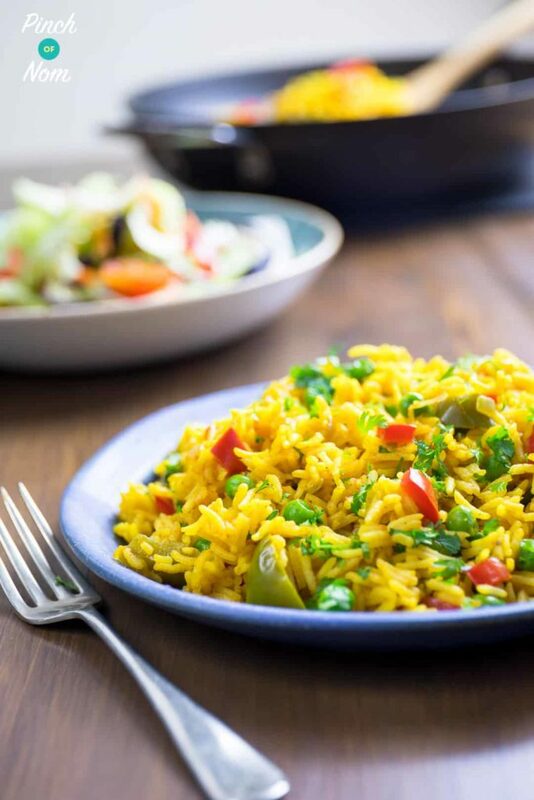 The Sunflower or Olive Oil flavours are ideal for this Syn Free Nando’s Spicy Rice recipe. Do you rinse the rice first? Making this tonight for dinner with chicken fajitas. Looking forward to it and so is the whole family. Looks lush! Can you freeze portions if you make a load? Yes you can freeze it as long as you cool it and store it correctly. Here’s a few tips…. I love everything Iv tried from your blog but will we tell me does it show on the recipe if I can freeze my left overs are it’s only me eating it and most make big size portions.! Is it 400gof dry rice as that seems a lot of 400g of cooked rice? ie: 160g dry weight added to make it 400g cooked weight? Yes, it is 400g dry weight of long grain rice. The recipe serves 4 people. If you are cooking for more/fewer people you can click in the Number of Servings box and change the number. The recipe will recalculate the amounts for each ingredient. So glad that you’ve enjoyed the rice, Diane! How do I stop my rice going mushy 😩. Taste lovely tho. Hi Samantha, we’ve given a guide time for cooking the rice, but you should check the packet instructions to ensure that your rice is cooked perfectly. 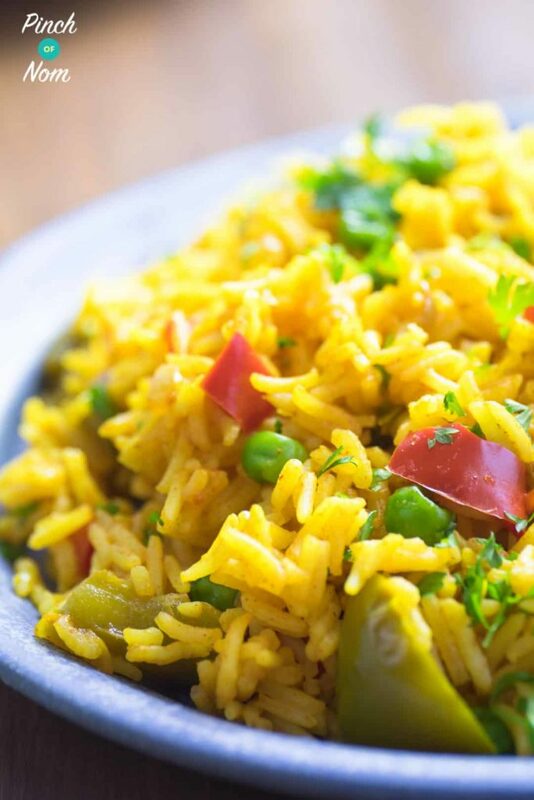 If you prefer the texture of the rice to be slightly more al dente, you can reduce the cooking time by a minute or two. Thank u! I’ll try again! Have just made this for lunch and wow, it’s lovely. Added cooked chicken for the last few minutes of cooking. Tempted to try adding fresh pineapple next time. Can i leave out the chicken stock pot? or, alternatively, what could be used as a substitute? You could substitute it for a different stock pot, or a stock cube instead – it just adds extra flavour! How much water to 400 g dry rice do you use. I haven’t tried it in the Instant Pot, so you might have to experiment a little! If you change the ‘Number of Portions’ to 2, all the quantities will change automatically for you. Hope that helps! It just says 0.5 on each. So is that 0.5 litres per stock? The original recipe lists 1 stock cube and 1 stockpot to 1 litre of boiling water for 4 portions. If you’re making 2 portions, you’ll need to halve everything. The recipe now reads half a stock cube and half a stockpot, so you’ll need half a litre (500mls) boiling water. Hope that helps. I made this last night but seemed to be more than 4 portions. It worked out to 8 portions. Do I halve the calories for that portion? With Slimming World, you don’t need to count calories at all. Just make sure you serve this as part of an optimised meal, i.e. served with one third of a plate of speed food. I am not aware of Slimming World but I did come across this recipe while searching for a spicy rice. And I am calorie counting for my daily eats, awesome recipe though. Hi, can this be eaten cold? Was thinking of taking it to work for lunch with some chicken? Looks amazing! Hi on which days can I have this original or green. Thank you in advance. Just made this today and it was beautiful! I added some mushrooms and celery to it aswell though to pack it out. 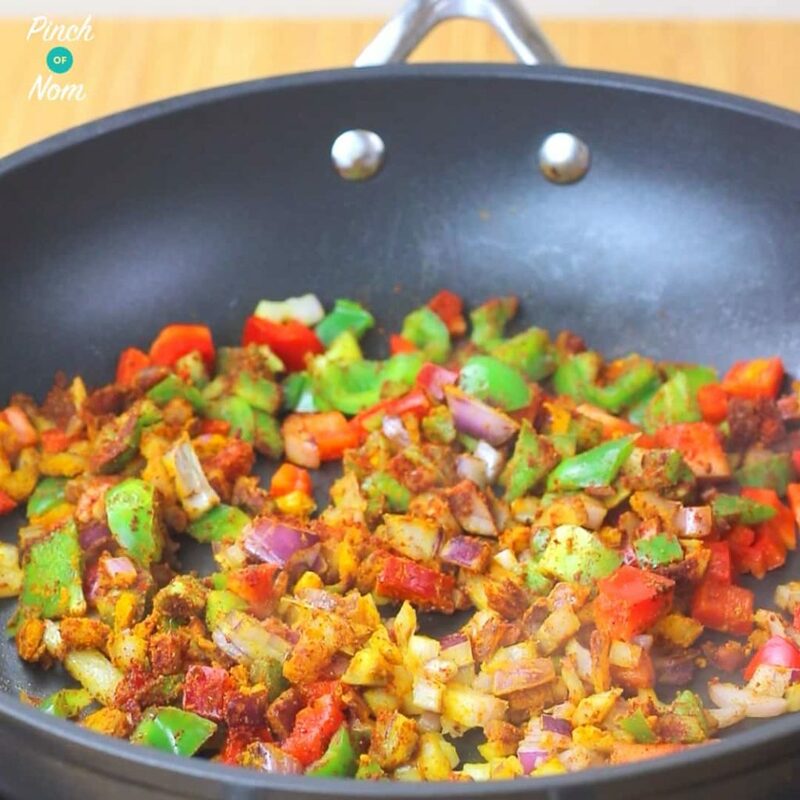 The easiest dish I’ve make and it’s lovely.. great for dinner suppers and even a picnics.. I have noticed that the 1litre of water required does not change regardless of the portion size set. It’s only the ingredients in the recipe table that are changed by the algorithm that calculates the different quantities. Unfortunately instructions in the text/blurb will not be changed automatically. can you use brown rice instead if long grain rice? Yes, you can use brown rice, but you may need to adjust cooking times slightly as brown rice will take longer. Sounds delicious, Moira. Thanks for getting in touch! My 4.5 yr old daughter is doing about healthy eating at school, she saw this recipe on my computer and asked to make it “because it’s got lots of vegetables in”. Well tonight she did (with a bit of help for the chopping and stock making) and it was delicious. We probably should have halved the quantities for 1 adult and 2 children but will freeze the leftovers. Delicious! Glad you all enjoyed it, Megan. I can’t understand how this is so low in calories when 100g of rice is usually around 350 calories! We’ll review the nutritional info and change it if we’ve made a calculation error. Please remember that, (as stated in the important info blurb) although pinchofnom.com attempts to provide accurate nutritional information, these figures should be considered estimates. Thanks for getting in touch. Where is the amount of ingreadents that is needed i cant see it thanks. Thank you for this recipe (and all your others). At a family bbq I had 5 different people ask for the recipe. I also love that you can amend your recipes for different numbers of people and you do the maths for me. Thank you for all your hard work!! Can you make this with brown rice ? Delicious, but mine ended up more of a risotto consistency… not sure what I did wrong? Have made lamb rogan josh lovely, now making nandos rice have people coming for supper but I am having to add lots more water help. Glad you enjoyed the Rogan Josh – it’s sooo tasty! 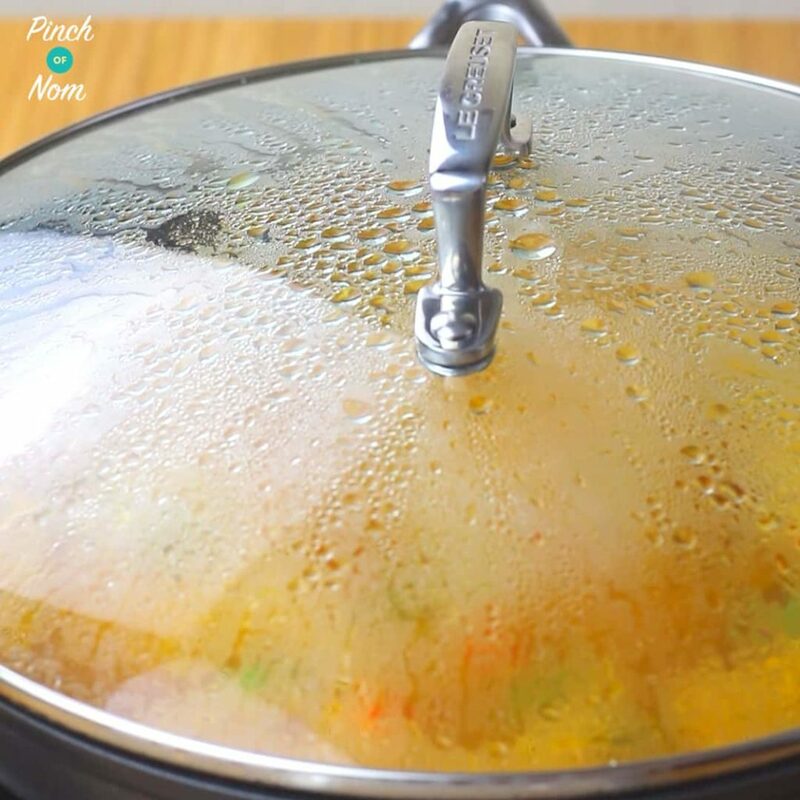 You need to use 1 litre of water to make up the stock for the rice. 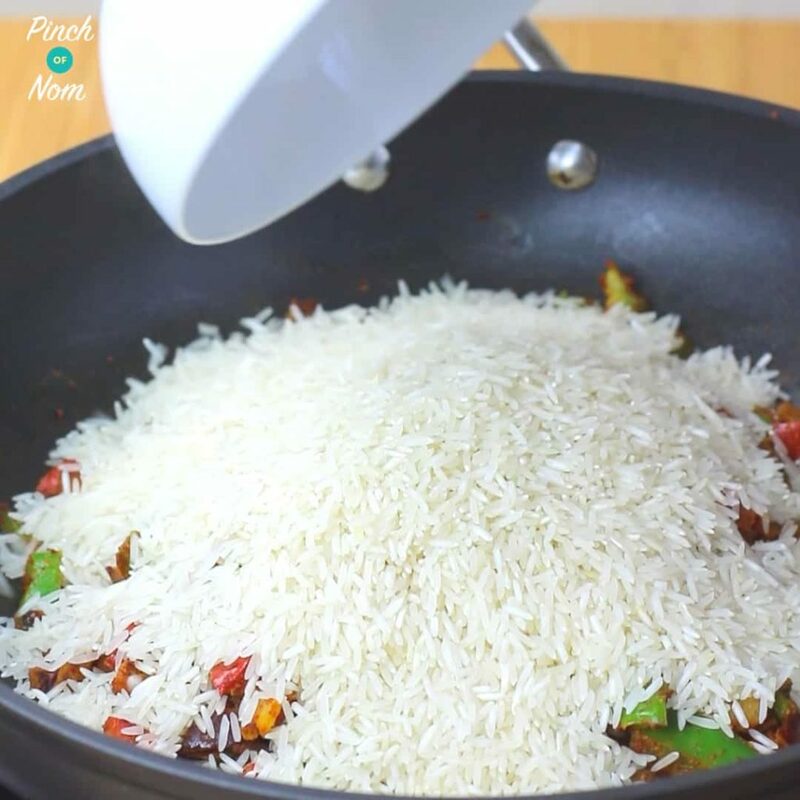 If necessary, you can add a little extra water to ensure the rice is cooked. Thanks for getting in touch! This looks perfect but if I don’t add the chilli powder will it change the intended flavour ? I’ve never used chilli powder before so don’t know if it has a flavour etc. I’m not good with heat.. It will just be less spicy. It won’t blow your head off, but you could always use less than we suggest in the recipe, just to give a hint of warmth rather than heat. Hope that helps. Loved this recipe, I cooked it for myself last night and it tasted great. The only thing I’d change (and it’s only because I like spicy stuff) is I’d up the chilli, I used 1/2tsp and even then it wasn’t quite hot enough for me. I’d probably use 1tsp next time to give it a proper kick! Gotta love a bit of spice! So glad you enjoyed it!